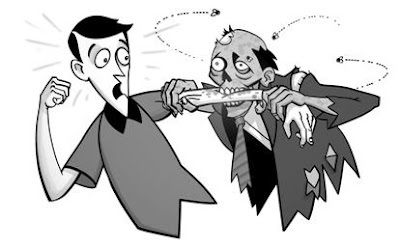 Seems like zombie books are crawling out of the woodwork; Not that I'm complaining. Especially when it comes to a unique premise such as Zombies For Zombies. So Max Brooks gave us the handbook. SG Browne gave us the dark comedy. Many authors have given us gruesome scares. Now we have a guide on how to cope with the recently changed zombie. Yes, this is serious stuff. I think the illustrations by Daniel Heard really help set the tone. If the name sounds familiar, it may be because he illustrated Tori Amos' graphic novel, Comic Book Tattoo. More of his work can be found here. Expect to see this book published Sept/Oct of this year! Excited yet? Can it get any better than a new and different take on our favorite subject done in a comedic tone? Yes. Yes it can. 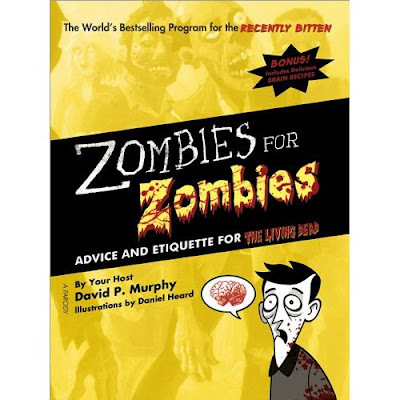 Zombies & Toys will have copies of the book to give away courtesy of author, David Murphy and Sourcebooks!!! Want to guarantee you get your copy first? Reserve it at Amazon by clicking here. Stay tuned, friends, more info to follow as I have it!